In this post, we will stretch the fabric that holds our reality together. We will bend the very nature of the cosmos to our will. We will likely waste 5 minutes learning the details of a game you have no intention of ever playing. 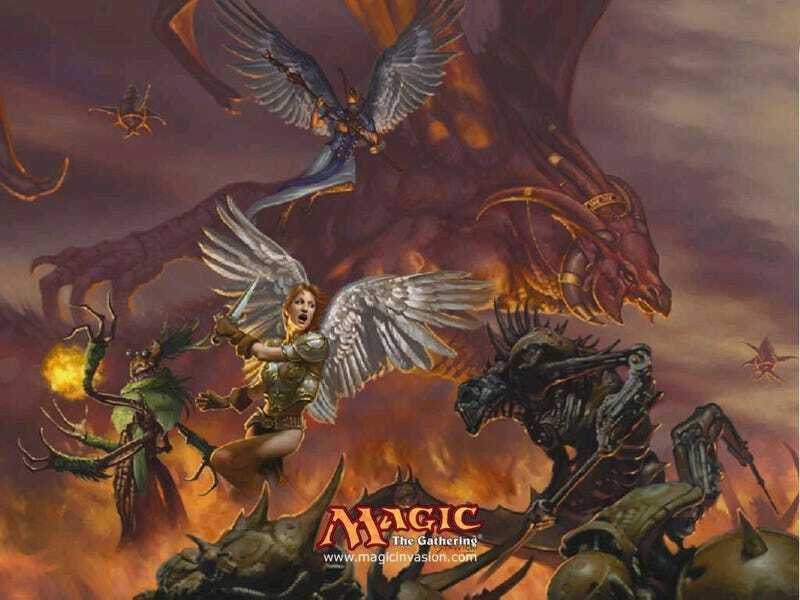 This post will do its best to provide you with a brief introduction to Magic the Gathering (MTG). How is this a LifeHack? This is more of an Un-Hack. Rather than make you more efficient, or help you spend less money, this post will introduce you to a game that was designed to make you spend money weekly in varying amounts and monthly in larger amounts. It's geeky, it's an addiction, it's like chess on steroids played with a board that exists only in Tolkein's Middle Earth. There are goblins, necromancy, wizards, and elves. If you're still reading, you're probably interested and you should know the basics. Why Now? This weekend is the pre-release to "Dragon's Maze", the 3rd and final set of the Return to Ravnica block. You may find yourself without something to do and enough cash from the washing machine and couch to spend on something as rediculous as MTG. Isn't MTG that Dorky Card Game from the 90's? Yes. And before you ask... No, it's not the same thing as Pokémon. The Setup: I need you to forget whatever preconceived notion you may have of how MTG is played. Done? Ok, good. Now, Imagine you're a wizard. You happen to be strolling along the banks of some river listening to the trees and birds, doing wizardly things, when suddenly you find another wizard across the river staring you down with the kind of eyebrows and emotion you'd typically see from someone after they found out it was you who left that Lego on the floor. The very same Lego they stepped on only moments ago. Now forget the Lego and river. This is really about two dueling wizards. Wizards can summon elementals, demons from the Abyss, they can call down lightning, they shield themselves from magic, and counter others with flicks of their wands, with movements of their hands, and shouts from their mouths. This is Magic! But how do you do all of that with just a few cards? Excellent question and I'm happy to see you're keeping up. Mana: Magic has a cost. To cast something like a lightning bolt at your fellow mage should cost less than casting something like... a summoning spell that calls forth a 34 and a half foot tree monster with a serious case of road rage and a taste for Magus buttocks. That cost is paid for with Mana. Mana is the life giving force harnessed by Wizards to cast spells. The forms of mana in MTG are Black Swamps (which typically call forth dark magic like vampires, zombies, and death spells), Green Forests (which typically call forth earth magic like elves, beasts, and additional mana), Blue Islands (which typically call forth illusory magic like ghosts, counter spells, and mind control), White Plains (which typically call forth divine magic like angles, blessings, and smitings), and lastly Red Mountains (which typically call forth fire magic like goblins, lightning bolts, and fireballs). Spells: The cards you spend mana to cast are called spells. There are several different types of spells. They are Summons (which summon a creature to the battlefield to fight for you), Sorcery (this one is actually self explanatory, these can be any type of sorcerous spell used to beat your opponent during your turn), Instants (these are like sorcery spells, but can be cast at any time, like during your opponents turn), Enchantments (these often similar to sorcery spells but they are played on the battlefield like creatures and stay there until removed), Artifacts (these are similar to Enchantments in that they stay on the battlefield, but they can produce so many different types of effects it's not worth trying to describe), and lastly Planeswalkers (these are mythical heroes you can summon to fight for you while they owe you loyalty). You've got mana to cast spells, and spells to cast, so now what do you do? You fight your opponent. This is where it can get tricky without actual cards and someone to physically walk you through a turn, but I'll give you the fly-by version. Step 0: Shuffle your deck and draw 7 cards. This step is pretty easy if you already have a deck to play with. I suggest picking up an "Event Deck" to start with. These are pre-constructed decks built for beginners to learn MTG. Step 1: Upkeep - This is where you untap all permanents (cards on the battlefield like lands (mana), creatures, enchantments, planeswalkers, and artifacts) and draw a card. Step 2: First Main Phase - This is where you can cast spells. You don't have to cast them all, you get another Main Phase after attacking. Step 3: Attack Phase - This is where you can declare which of your creature are going to attack your opponent, they decide which creatures get blocked and which go through to hit your opponent for damage. This phase is the most difficult to understand and there are quite a few additional rules I don't have time to go over. Step 4: Second Main Phase - This is where you can cast another round of spells. You can't attack again. Step 5: End - This is an actual step because some cards say something like "At the beginning of your End Step, do this". Also, if you have over 7 cards in your hand, you need to discard down to 7. The Point of the Game: Each player starts out with 20 hit points. The objective is to get your opponent down to 0 or less hit points. The first player to drop to 0 hit points or less loses the game. Someone might reference the stack. This has to do with Abilities (which I didn't go over) and Instant spells. This is an order of precedence thing and I can summarize using Manufacturing speak: First In Last Out. The last spell cast in a stack war is the one that takes precedence first. If you enter a draft and open a pack to reveal a Planeswalker... odds are you should draft it. I've seen quite a few newbies pass on cards like this and they are super powerful. Just draft it. If you enter a draft, take as many creatures as you can. You can't go wrong your first time with too many creatures. In a draft, you need to make a 40 card deck from the cards you drafted. 24 spells and 16 land. That's a solid number. In a draft, don't exceed more than 2 colors (Black, Green, Red, White, and Blue). 3 colors can work, but it's hard to win without a way to fix your mana situation. Just trust me on this. Summary: This is by no means an exhaustive tutorial on how to play MTG. In fact, with the few directions I've given you above, you still can't play magic. You need someone to teach you the mechanics. But that's what can be so great about MTG. That guy with the funky BO in the corner of your local game store is probably super cool and is just waiting for someone to ask him how to play MTG. He'll probably stutter and talk about efficient color combinations, he may even try to talk you into playing Pokémon (otherwise known as the dark side), but he's been playing for years and has invested every cent into his collection of MTG cards and car (the Toyota Celica in the parking lot with a 3 foot tall spoiler and missing front bumper). He's probably hopped up on caffeine and gushers, but you may have just made a new friend and started a disgusting habit that will take up what little free time you have. This is a life Un-Hack. A way to waste all of the time you've gained being efficient by reading other LifeHacker articles, a way to spend what little money you have, and a way to make some fun happen with new people, a few cards, and your imagination.